Good Samaritan Hospital, a member of the Westchester Medical Center Health Network (WMCHealth), has opened a dedicated Obstetrics Emergency Department that offers high-quality, specialized labor and delivery care around the clock to expectant mothers and families. 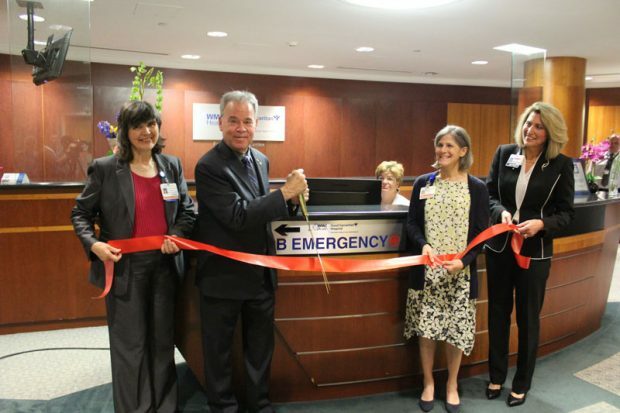 The Obstetrics (OB) Emergency Department (ED) — the only OB-ED in the Hudson Valley — was made possible through the creation of the Good Samaritan Hospital OB Hospitalist Program, a partnership with the OB Hospitalist Group (OBHG). The program’s board-certified OB physicians are on site to ensure expectant mothers receive expert care at a moment’s notice. Physicians and highly skilled nurses deliver babies if a patient’s own physician is unavailable. They also respond to obstetric emergencies and maintain a calm setting that prioritizes a patient-first culture. The Good Samaritan Family Birthing Center is the premier birthing center in Rockland County, with more than 3,000 births anticipated this year. The Family Birthing Center recently received a five-star rating for vaginal delivery from Healthgrades, the leading online resource for health information. The Center offers a 10-bed Level II Neonatal Intensive Care Unit (NICU) that safely cares for babies born at 32 weeks or older who weigh over 3 pounds. Due to the Family Birthing Center’s close affiliation with the Regional Neonatal Intensive Care Unit (RNICU) at Maria Fareri Children’s Hospital, another member of WMCHealth, high-risk mothers and infants can be seamlessly transferred there if needed. Pictured above: (From left) Mary P. Leahy, MD, CEO of Bon Secours Charity Health System, and Rockland County Executive Ed Day, with Good Samaritan Hospital’s Patricia Pollio, MD, Director of OB/GYN, and Susan Sippel, MHSA, RN, Administrative Director, Maternity.